Since we don't have a functioning Violaman.com in which to share this, I thought I'd post this interesting performance here. I'd like to see Christen Lien and Zoe Keating do some sort of duet. Talent and a few looping pedals make for a nice performance. What is the playing length of viola string's and could you put them on a violin ? 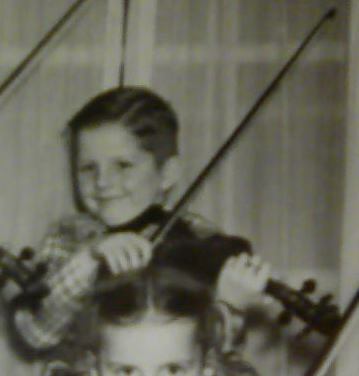 She's looks to be playing a full-size viola, which would be 2-3 inches longer than a full-size violin. I suppose if you put viola strings on a violin, you'd be making the equivalent of a 14" viola. I really don't know what other physical differences there are between a 14" viola and a full-size violin are. Perhaps Pierre might know. I do know that you shouldn't expect the same richness of sound from the smaller body of a violin that a viola can create for the lower notes, though. EDIT: Barry beat me to the 14" viola info. Violin has a 13" playing length, I'm almost possitive. Already have a violin, but don't don't what size it is? The following chart displays various violin measurements and their corresponding violin size. 4/4 full size violin 14" 23.5" 7.5"
7/8 size violin 13.5" 22.5" 7.25"
3/4 size violin 13" 21.75" 7"
1/2 size violin 12.5" 20.5" 6.75"
1/4 size violin 11.5" 18.75" 6"
1/8 size violin 10.25" 17.25" 5.5"
1/10 size violin 9.25" 16" 5"
1/16 size violin 8.25" 14.5" 4.45"
16.5" viola 16.5" 27" 9"
16" viola 16" 26.5" 8.75"
15.5" viola 15.5" 26" 8.5"
15" viola 15" 25" 8"
14" viola (4/4 VI) 23" 7.5"
13" viola (3/4 VI) 21.75" 7"
12" viola (1/2 VI) 20.5" 6.75"
Ah... we are BOTH right - just about different things. I was focused on the SIZE of the instrument, and your original question was the playing length, which I presume is the length between nut and bridge. I gottcha,,, the total length of the body is 14", on both mine, Chinese and Cremora. The height of the ribs on a viola is considerably greater than a violin giving the viola a larger volume and producing a more mellow tone. Totally understandable.... there's more room for more air, for resonance. That was a really beautiful piece. I'm really really digging the sound of the viola. But I'm a little ignorant...can any of you viola players tell me what music you play on it or can you just play a tune written for a violin or fiddle, as if you were playing the fiddle? Then the notes played would actually be lower. Or do you have to have tunes specifically for the viola and if so, are they difficult to come by? Now I really want a viola. Man this is so addicting! @Helvetika I believe the Viola actualy uses an alto clef. Basically meaning that the lines and spaces on the staff represent different notes on a different area of the piano for comparison. I thought the strings were c, g, d, a. just 5 notes lower than violin. So wouldn't the D and the A be on the treble clef. I realize the notes would be different, I just thought that maybe you could still play a tune meant for the fiddle, and it would still sound ok, just lower, if you used the same finger placement as if you were playing the fiddle. if you know what I mean. On a viola on its C string one can play notes at lower pitches inaccessible to a violin, as the violin´s voice only starts at the G a "fifth" above the C string that is on the viola. Hence a viola can produce C C# D D# E F and F# which are all in a range beneath the lowest pitch of a violin. I tried transfering the Jacky Tar score from treble clef for violin to alto clef for viola (take a blank piece of music manuscript paper and copy the violin score by moving every note in the treble clef version down by one unit). I do not regard the outcome as a success. I did it because I could not find the Jacky Tar in a viola version online (free). You can mostly play violin music on a viola "as is". But if you do so, you will find there is no need for the viola to have the C string, as you would never use it if you confined yourself to violin scores. But on a viola you will not be able to play some of the double stops that violinists can play by bowing the violin´s A and E strings simultaneously. Some violinists are suspected to be rather jealous of the viola´s C string. And the viola can produce double stops on the C and G strings, which a violin cannot. You might also ponder whether cello music can be played on a viola ? Cello music uses the bass clef. That was lovely. Great use of the looping machine on that. I'd say that's probably a skill in and of it self. That was really beautiful. It has such a mellow sound. The looper pedal has been on my wish list for a while now, I have fun with pedals on my electric violin... gonna need to move the looper up on the list!